Salares, Archez, Salares, Sedella, Canillas de Albaida, Canillas de Aceituno, Competa, all villages which stand at the foot of the impressive Tejeda and Almijara Sierras; all morisco (Moorish convert to Christianity) villages, where vines were the main crop and are still an important element in the landscape as well as the economy; all display similar characteristics, reflecting the true essence of the Axarquia region, its scenery, its way of life and its history. The highlight of the village is undoubtedly the minaret of its church, declared a monument of historical and artistic importance. Before the arrival of the Romans. Salares had been inhabited by the Phoenicians, Greeks and Carthaginians. 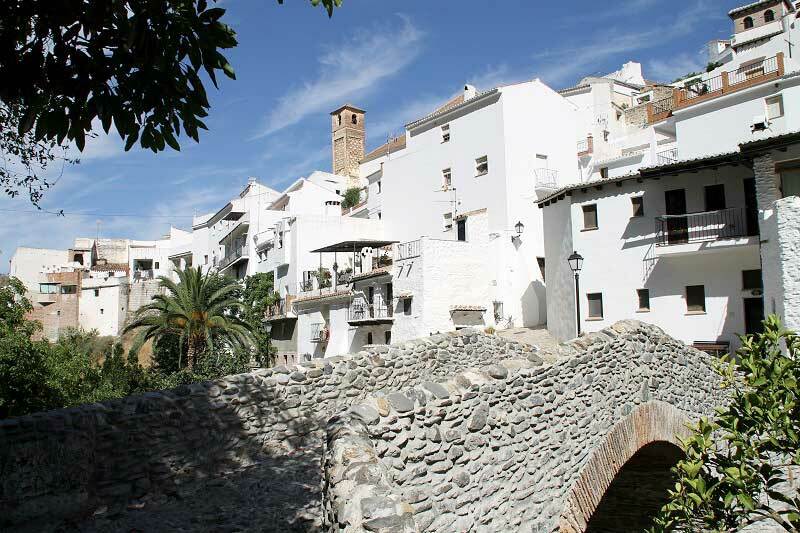 The Roman era, during which the village was known as Salaria Bastitanorum, saw the building of the bridge over the River Salares which still stands in excellent condition at the exit from the village and is still in use. The village’s urban design has changed little since Moslem times. A small castle once stood here, though all that remains today is a tower which now forms part of a dwelling known as the turret house. The church still conserves the minaret of the former mosque, covered in sebka material and tiling, as its belfry, as well as several pillars discovered during its restoration. Following the capture of Velez-Malaga by the Catholic Monarchs (1487), the inhabitants of Salares were subjected to Christian rule. in 1492, the Catholic Monarchs gave control of Algarrobo, Salares and Benescalera (no longer in existence) to Don Pedro Enriquez, Chief Governor of Andalusia, but he died that same year, and the aforementioned villages were inherited by his widow, being known for a time as “Catalina de Rivera’s territories”. Years later, 1569 saw an almost general revolt by the moriscos (Moslem converts to Christianity) of Salares, Cutar, Benamargosa, Competa, Sedella, Daimalos and other villages in the Axarquia region against Christian rule; the rebels established themselves at El Peñon de Frigiliana, where they were finally defeated by the governor of Velez, Alvaro de Zuarzo. His ruthless oppression was followed by the definitive expulsion of the moriscos from the area in 1791. On Christmas Day 1884, the village and its municipal area were shaken by the major tremor known as the Andalusian Earthquake, suffering extensive material damage.